Medications are prescribed for many reasons, usually for labeled indications but other times off-label. Knowing why medications are prescribed is essential to help understand the continued need for therapy as well as to determine payment responsibility in this time of Medicare Part D risk. Namenda (memantine) is well known for its labeled use in treating cognitive decline in patients with moderate to severe Alzheimer's disease. However, its off-label, and potentially related, uses may be less known; for example in managing symptoms such as those in vascular dementia. Recently is has also been used off-label to prevent cognitive decline in patients receiving Whole Brain Radiation Therapy (WBRT)1–2. 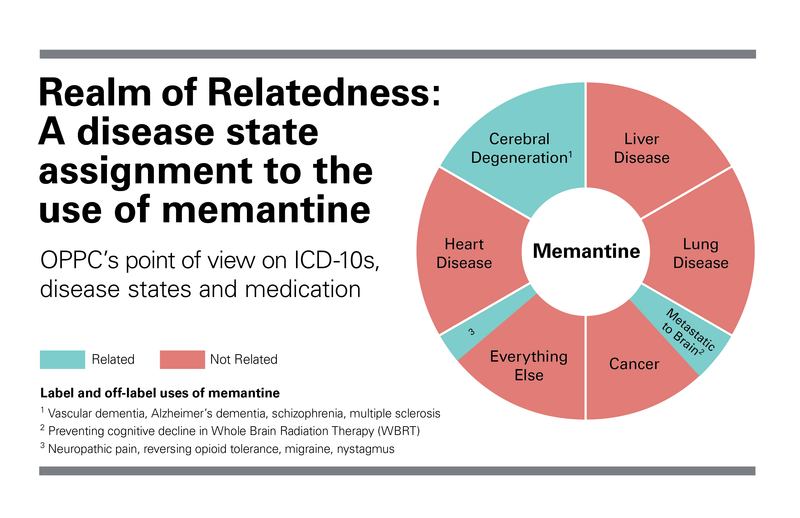 In this case, where the cognitive decline is caused by treatment (radiation) related to the terminal diagnosis (brain cancer), memantine use would be considered related, and therefore payment responsibility would fall to the hospice. Should hospice decide that continued use of the medication serves no palliative benefit, and the patient/family choose not to discontinue the medication despite hospice’s advice, payment responsibility switches to private pay (in this instance it is highly recommended that hospice follows processes set up by Part D providers, via the W9 form, to notify them of hospice’s determination that the medication is not part of the palliative plan of care). It is important to recognize that payment responsibility becomes a moot point if the drug is stopped. The potential benefits of memantine use for this indication are most likely to be realized by patients with a favorable prognosis and who’ve responded well to radiation2. Since neither of these characteristics are likely to apply to hospice patients with terminal brain cancer, this is typically a deprescribing opportunity. Written by Amanda Rixen, PharmD Candidate, University of Iowa College of Pharmacy 2017. Reviewed by Joseph Solien, PharmD, BCPP, CGP. Joe is the Senior Clinical Pharmacist for OnePoint Patient Care and based in Tempe, Arizona. 1. Attia A, et al. Treatment of Radiation-Induced Cognitive Decline. Neuro-oncology. 2014:15:539-550. 3. National Hospice and Palliative Care Organization’s “Determining Relatedness to the Terminal Prognosis Process Flow,” 2014, Ver. 1.0.